« Now the White House Wants to Raise Taxes without Congressional Approval?!? Bad ideas definitely have the ability to cross borders. The income tax first appeared in England, on a temporary basis during the Napoleanic wars and then permanently in 1842. It then spread like a cancer to other parts of the world, eventually reaching – and plaguing – the United States starting in 1913. Government-run Social Security schemes were started by the Germans in 1889 under Chancellor Otto von Bismarck. Similar programs then were adopted elsewhere, including the United States as part of FDR’s misguided New Deal in 1935. I wrote last month about how the State Department’s refugee program is a trainwreck because it is bringing Somalis (many of whom have an anti-Western ideology) to America and trapping them in government dependency with a plethora of handouts (and also creating a breeding ground for terrorists). Well, our cousins in the United Kingdom also have a refugee program that is similarly counterproductive. I don’t know which country was dumb enough to first create its program, but the Brits win the prize for subsidizing the most infamous terrorist (and new member of the Moocher Hall of Fame). Jihadi John and his asylum-seeking family have milked the British benefits system for 20 years, the Mail can reveal today. Housing the Islamic State executioner and his relatives in affluent parts of London has cost taxpayers up to £400,000. One landlord said Mohammed Emwazi’s family were ‘parasites’ and ‘tenants from hell’. Incredibly, they are still believed to be pocketing £40,000 a year in handouts despite there being no sign of them in Britain. …Westminster City Council is still paying the rent on the family’s £600,000 flat even though the rules say housing benefit should normally be stopped after 13 weeks. So did all these handouts to the Emwazi family turn them into good citizens? Hardly. One of the kids, Mohammed Emwazi has gone to the Middle East to fight for ISIS and is now infamous at “Jihadi John,” the psychopath that beheads innocent people. MPs said they were horrified that the child of a family given refugee status, citizenship and benefits had returned the favour by orchestrating the murder of two of its citizens. 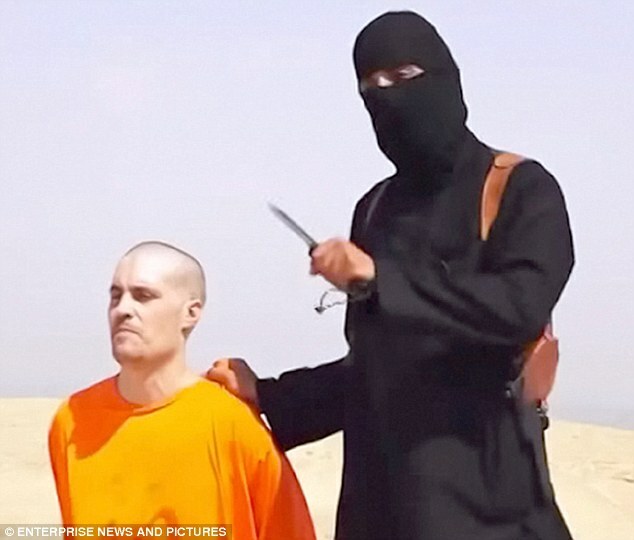 …In sickening propaganda videos, his son led the beheadings of Britons Alan Henning and David Haines. But even if Jihadi John hadn’t turned into a nutjob, British taxpayers still got a very bad deal from the Emwazi clan. The family apparently is still on the dole, continuing an unbroken 20-year tradition of mooching off British taxpayers. During their time in Britain, neither Jasem nor Ghaneya officially worked. …With a 12-year-old daughter, Hana, they are still believed to be claiming an estimated £7,821 a year in child benefits and child tax credits. That is on top of annual claims of about £23,400 in housing benefit, £678 in council tax support and £5,929 in jobseeker’s allowance. Looking at this result, logical people might be tempted conclude that it’s time to rethink refugee programs. Or, at the very least, change the rules that funnel these people into government dependency. But since many politicians aren’t logical, there are probably British versions of Barack Obama who are urging job training programs or similar nonsense (for a humorous take on that topic, see the cartoons at the bottom of this post). P.S. Jihadi John featured in one of the most effectively snarky anti-Obama cartoons I’ve ever seen, which is at the end of this post. P.P.S. Switching to a different topic, I’ve written (some would say ad nauseam) about disproportionately generous pay and benefits for government bureaucrats. Particularly for the gilded class in Washington. I think the evidence for excessive bureaucratic compensation is ironclad, particularly if you look at “quit rates” by sector. But now we have yet another piece of evidence that the federal workforce is living on Easy Street. Check out this new polling data from Gallup. Remember, this is polling data with federal workers describing their own status, not what taxpayers think. So let’s give 44 percent of bureaucrats credit for honesty, which is ironic because bureaucrats in polls have acknowledged they’re more likely to be dishonest! And lazy as well. Though the real moral of the story is not compensation. As I explain at the end of this video, the real problem is that many government jobs shouldn’t exist in the first place. P.P.P.S. If you want to enjoy bureaucrat humor, click here, here, here, here, here, here, here, here, here, and here. the total cost to the American taxpayer for allowing the Tsarnaevs refugee status will run into the millions… welfare… the Boston bombing… lockdown of the entire city…. medical expenses… the trial… not to mention the deaths and maiming of our citizens… the cost for this manner of political blundering is immeasurable… and it’s just too dammed high…. was this a one-off? not at all likely… state is bringing in potential terrorists by the thousands… with the full blessings of the Obama administration… terrorist organizations are threatening to send hundreds-of-thousands of refugees into Europe… salted with seasoned fighters… it’s just a matter of time until they get to us… asymmetric warfare is in play… and this time on American soil…………. 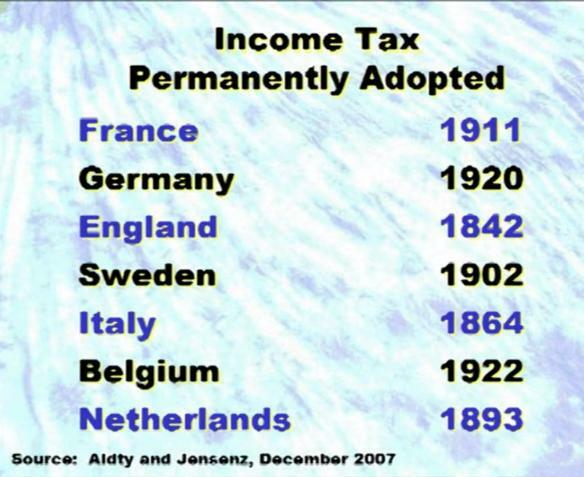 Technically income tax has not been permanently adopted in the UK. It was adopted as a temporary three year measure to deal with a temporary financial crisis. It has been extended for a year at a time every year since.